The biggest obstacle to utilizing UAVs for building documentation has been the prohibition on flying within restricted airspace surrounding airports. Since 2016, authorization to operate in this airspace has depended on case-by-case review by the Federal Aviation Administration with a typical lead time of at least 90 days. By 2018, the backlog for reviewing airspace authorization requests had grown to 6 months or longer. 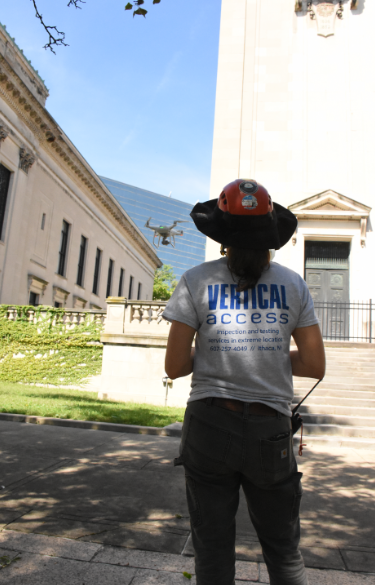 Shown here is Kristen Olson surveying Springfield, MA’s Campanile clock tower with a drone for Bruner/Cott Architects. We are assisting with a wide range of discovery phase tasks as part of the Springfield Campanile Restoration and the drone is one tool helping us provide a complete picture. Beginning earlier this year, the FAA made available a new system for requesting authorization to operate UAVs within restricted airspace, called LAANC, or Low Altitude Authorization and Notification Capability. LAANC is a partnership between the FAA and third-party providers such as AirMap and Skyward, who have developed app-based platforms to allow UAV pilots to apply for and obtain airspace authorization in near-real time. LAANC was rolled out over a period of six months, and as of September 13, all of the regions in the US are on-line, although not all airports are participating as of this time. The LAANC concept is based on maps showing predetermined maximum flight altitudes in a grid pattern surrounding an airport. While flights very close to airports are still off-limits (or will require a more rigorous application and vetting process), the LAANC system greatly expands the possibilities for UAVs to gather valuable information about buildings and structures in U.S. cities. To put it in perspective, more than half of the downtown areas of Albany, Boston, Baton Rouge, Phoenix, Salt Lake City, and Kansas City (to name just a few) were effectively off-limits to commercial UAV flight prior to LAANC. The next development, still years away, will be a system developed by the FAA and NASA to fully integrate low-altitude flight into the national airspace.